New Delhi: Pepsico Inc. is targeting 50% of its annual revenue from emerging markets in the next five years. Indra Nooyi, the chairman and chief executive of Pepsico Inc. articulated the target in Delhi during an interaction at AdAsia 2011, an advertising conference. Speaking to John Wren, chairman of Omnicom Group Inc, at the concluding session of the conference, Nooyi said developing markets were seeing explosive growth in a global economy whose size is pegged at $62 trillion today. The number is likely to reach $300 trillion or more by 2030. “I wish 60% of the business was from developing and emerging markets. But I think ideally, in the next five years if we could get to 50:50..."
Nooyi’s enthusiasm for the emerging markets is understandable given that Pepsi’s second quarter results saw its revenue rise on high growth in emerging markets, according to several international media reports. Its revenue rose 14% to $16.8 billion with emerging markets seeing an 18% increase in sales over the previous year. In India, said Nooyi, it is critical for the company to substantially scale up the number of retailers in its channel from 2 million. “I think it should be 5 million." Home to over 100 brands under the Pepsi-Cola, Frito Lay, Gatorade, Tropicana and Quaker labels, Pepsico was in the news recently for granting $8 million to Water.org, an international not-for-profit organisation, for expansion of safe water and sanitation projects in India. 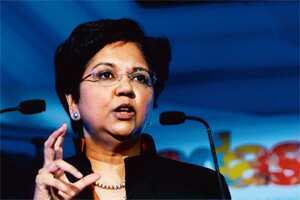 Nooyi also spoke of Pepsico’s latest methods to prepare for uncertain times. Globally, she said, the company is developing “action learning programmes" under which 300 critical positions have been identified to develop a “leadership cadre". “To each of these jobs we have identified one candidate who can take that job in four-five months, two candidates who’ll be ready in one-three years and three candidates who’ll be ready in three-five years. In all, we have about 1500 people and if you eliminate all the overlaps it comes to about 1200 people that we are tracking all the time and putting through rotational assignments and learning exercises," said Nooyi. She also added that despite living in an era of “negative uncertainty" it was important to accept and “adapt". Nooyi stressed five key “thoughts" she learnt during uncertain times: accepting the new reality of uncertain economic progress, where currencies are volatile and commodity prices unpredictable; leading for today and tomorrow at the same time; being ambitious and making big changes to big things; attracting and developing the right talent; and being super-visible as a leader. “If the leader doesn’t tell them, someone else will. There will be press speculation. Rumours will circulate in the workplace."